Sarasota Florida has everything: Class, culture, history, weather, shopping, theater, nightlife and fabulous restaurants. pure white sand and crystal blue water. And others come to visit the Ringling Mansion filled with art and artifacts of John and Maple Ringling's travels around the world. The beach is beautiful and popular and many beachfront estates occupy some idyllic real estate. These mansions share the splendor, probably somewhat reluctantly, with condo buildings, hotels and elegant resorts. Sarasota Florida is most comfortable around April, when temperatures range from 70 down to 50 or 60 degrees. The rest of the year, you’ll find the temperatures in the 80s and 90s with the Gulf water at a constant of about 87 degrees. Scuba diving is popular here, as is beach lounging, shelling and surfing. Join in a beach volley ball game or start one. People are very friendly in redneck country. Sarasota Florida is probably best known as the home of the Ringling Brothers. This beautiful beach is located in the original “circus town” and the Ringlings were generous benefactors and donors to the culture here. Sarasota hold a festival every December celebrating the birthplace of this famous traveling circus family extraordinaire. 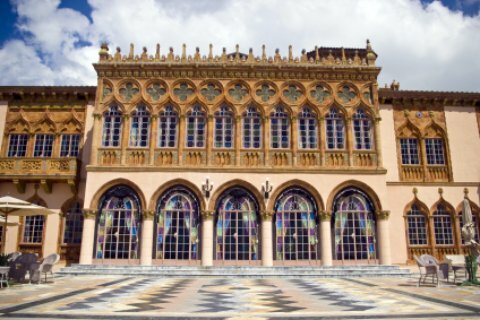 Your visit to Sarasota would not be complete without a visit to the John and Mable Ringling Museum of Art. The museum is the former mansion of the Ringlings. Here, you can view the various personal collections of this magnificent traveling circus family as you relive their life and history through their belongings. Marie Selby Botanical Gardens is a gorgeous 1920s historical home that overlooks the Sarasota Bay and contains over 10 acres of botanical gardens. It is known for its incredible collection of over 6,000 orchids. For those that enjoy antique cars, Bellm’s Cars and Music of Yesterday offers many different kinds of displays of antique cars where enthusiasts can drool over beautiful historic cars and learn a little something about history as well. Kids of most ages: Get up close and personal with marine life at the Mote Marine Laboratory and Aquarium where you can enjoy the 135,000-gallon tank full of marine animals as well as several other exhibits with sharks, lobsters, seahorses and more. If you’re visiting Sarasota the last week of December, you and the kids must go to the International Circus Festival and Parade to celebrate the circus town with other tourists and locals alike. Eating: Barnacle Bill’s Seafood serves some of the freshest and most delicious food you’ve ever tasted. Also perfect for a classy night out on the town is Déjà vu, which serves a variety of different types of food… all of which are fantastic. You will not find a shortage of restaurants here but these are a few that stand out! Sleeping: There are many hotels located right on the beach. A great mid-priced hotel that offers comfort and convenience all in one place is the Holiday Inn Sarasota. If you have a bit more to spend and are looking to live a life of luxury during your stay, The Ritz-Carlton, Sarasota does not disappoint.